Play is at the top on my list as a great way for boys (and all kids) to learn. We love to play in many different ways and one thing that we enjoy is taking what we already have in the house and making a new game with it. I write about activities for boys on a regular basis and love to find things that are fun but also add a bit of learning into the mix. This game fits the bill! Playing games together as a family makes for great memories. 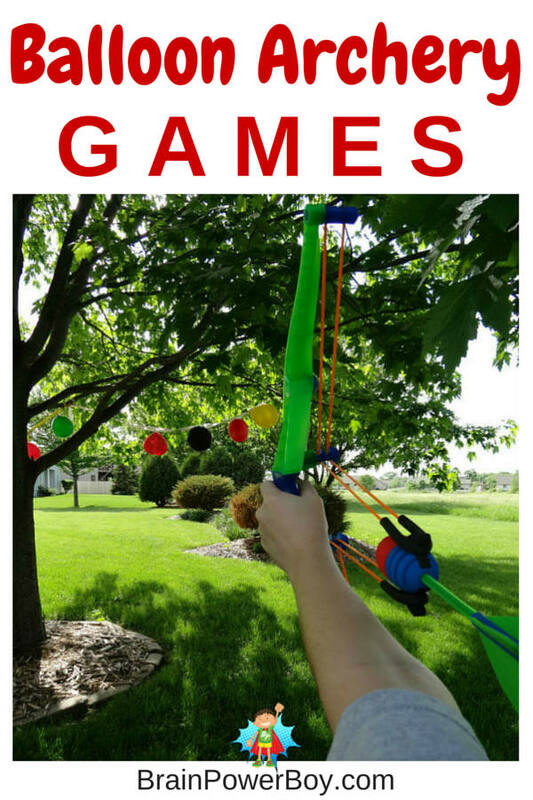 So grab your bows and head outside to try these fun balloon archery games! Balloon pump (optional) I love this balloon pump as it saves me a lot of huffing and puffing and you get bonus rocket balloons! We had just finished a birthday party at our house and we decided to recycle some party decorations into an enjoyable, and somewhat challenging, game. We always have streamers and balloons at our birthday celebrations (it’s a requirement!) and try to find something fun to do with them when we take down the decorations. This time we decided to take the fun outdoors. We grabbed the streamers and headed to the backyard. The tree seemed like a great place to string them up. If you don’t have a tree in your backyard, you could stick a couple of poles in the ground and attach the string to that, or you could also put it between some lawn chairs. After we had the balloons stung up we were going to toss balls at them but my son had a much better idea. We got out the Zing Air Z-Curve Bow (see our review by clicking on the link) and got ready to do some archery. We tried different distances, and talked about what happened if we shot up in a curve, how far we have to pull back, and what the best strategy was for hitting them. Color Game: Attach different colored balloons to a streamer. Each person gets a different color. If you hit your color you get a point, if you hit someone else color, they get the point. Play up to a specific number (say 5 or 10.) Person with the most points wins. Miss It Game: Try NOT to hit the balloons. While shooting, try to slip your arrows between the balloons. Super challenging. Common Goal Game: I like cooperative games and we often play them. There are plenty of opportunities for competition in society and our goal is simply to have fun so we play together to achieve a goal. Here are two fun cooperative ideas. Try to hit one of each color balloon or try to get to a certain score as a team. Free Play Game: Or go totally free-form and just shoot! We were hoping to pop a few balloons, but even up close we couldn’t get them to pop. Bother! My big tip: if you have young shooters, play on a calm day. It was windy when we played and the gusts of wind it made it very hard to hit the targets! Such simple games to play but we really had a great time. I hope you will grab a few supplies and play a balloon archery game. Thanks for stopping by! If you are looking for more activities for boys to do, books for boys, LEGO fun, and other great boy stuff please sign up for our newsletter. We would love to send you ideas for boys, including things I don’t share here on the site. SO much fun! This is going to be a great summer activity. And believe it or not, my Mother-In-Law is going to be in LOVE with this! I am thrilled to hear your Mother-in-Law might have a go! Thanks for stopping by and leaving a comment. So glad to hear your kids would enjoy this. We have used cups before–plant pots is another good idea. My son liked that this was up in the air and that the balloon targets moved a bit as well. We love our Zing Air Z-Curve Bow (and no they didn’t pay me to say that or even send me one LOL) I’m sure your boys would have a blast with one. How fun is this!? I think even my teen boys would love it! Very smart of you using left over party decorations. Looks like they had tons of fun! I do think your teens would have fun with it — I did 🙂 It was really fun. I love aiming games and because it was a bit windy this was a enjoyable challenge for me. Nice to see you! Neat idea to try it with water balloons. We may have to give that a go as well. Oh! My grandchildren would love this. Looks like some great spring/summer fun. Now if spring would just arrive. Thanks for stopping by. I know, right, I can’t wait for nicer weather. Hope you and your grandkids enjoy it. 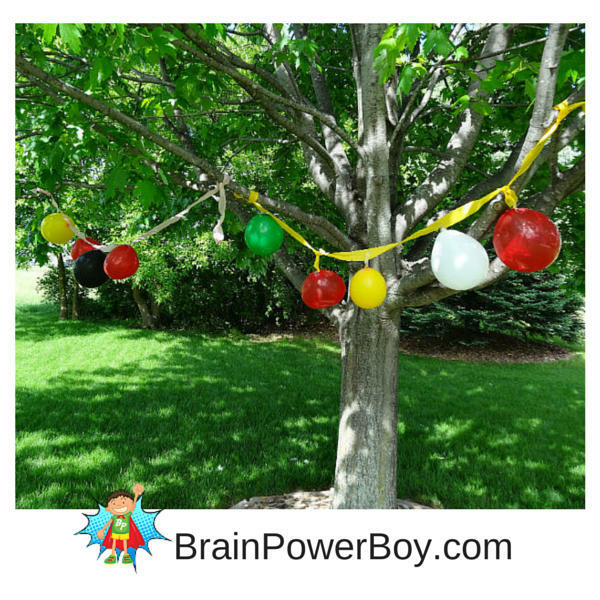 Such a fun idea for outside once it stops raining here We love all things associated with balloons. We love balloon activities too. It is a tad cold here right now for playing it. Have a great time giving it a try when your rain stops. Wow, my grandsons would love this! We are going to have to do this for them this summer! Super 🙂 I hope your grandsons enjoy it. Looks like a fun game! We have 3 granddaughters living with us short term and I’m starting to plan ideas for the summer. I’m sure this would be a hit. I know my munchkin would love this! He could even use a rubber band rifle until he gets a bow and arrows. Thanks for sharing! Yes! Great idea to use a rubber band rifle. This is absolutely amazing, I can’t wait to try this out with my son when he’s a little older and has the co-ordination. This is going to be on our Summer outdoor play list.Thanks for Taking part in the Parenting Pin-It Party. my son would LOVE this! We already have a bow and arrow which he can’t get enough of so I know this would be a big hit! Thanks for sharing at our FB Share day. Good to hear that he would Love it 🙂 Thank you for having a share day. I always enjoy stopping by to see what you are up to. This looks so fun! As soon as my boys are older we will try this. Thanks for sharing with the Frugal Family linky!